Fitness Facilities are quickly becoming the “one on every corner” business. With so many fitness related options available, why choose Precision Personal Training? Unlike those big box gyms and crowded spin classes, the educated, experienced professionals at Precision are committed to one thing: helping you! 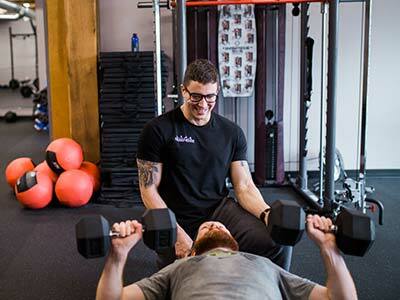 Here at Precision, we toss aside cookie cutter programs and focus on a personalized health and fitness screening to help bridge the gap between your health and fitness history and your goals. We are committed to helping you achieve your goals. Looking to lose weight? Move better? Eat healthier? We are driven by your success. In just 30 minutes, you can achieve a killer workout – everything you need to make you feel accomplished and ready to win the day! It is our personal mission to rekindle your internal motivation and inspiration while supporting you every step of the way! Surround yourself with like-minded people. Our clients support each other and work together to prove the unbelievable achievable! We will develop a routine through your personalized health and fitness prescription while meeting your availability and budget. 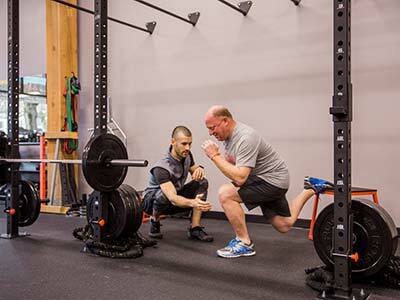 While working with your body mechanics, we build a fitness routine that is both challenging and innovative. It is key to ensure you lift mindfully to reduce your risk of injury, we support your body’s natural movement patterns. Our trainers work to strengthen your body after injuries as well as preventing further damage to keep you strong and healthy. Everything begins with a complimentary, initial Health and Fitness Prescription. During this 1hr session, our goal is to listen: to your mind, body, and soul. By reviewing your health and fitness history, assessing your posture and movement mechanics, and setting a few goals with you, we aim to build a proactive regimen to bridge the gap between you and your goals. Depending on your goals and personal needs, we will construct a weekly structure to help guide you. This structure may include meal planning and food prep, meditation, exercises to perform outside the gym, personal training, and anything else that may assist in achieving your goals. During a fitness session, you can expect to be guided through every step needed to ensure success. We begin with a warm-up, a few basic ranges of motion and stretches prime your body for the exercise to come. Following the warm-up, we move into movement practices specific to your exercise prescription. Depending on your goals and abilities, this may include full body integrated moves that incorporate functional movement patterns to assist in your life outside of the gym. Getting Started On a budget? As we guide clients of all levels with varied budgets, our aim to create a program that fits your wallet. Life can be stressful enough, and we don’t want the monetary investment in your health to withhold your from putting food on your table. We can work with you to find a program that works for your budget as well as your body.